Posted: Fri 17 Sep, 2010 7:44 am Post subject: Where is the modern need? I could say the ceremonial sword I carried in the Navy (and still own) is a "modern" sword. And it has already also been said that there are, in fact, several makers that make "modern" interpretations of ancient styles. These are therefore "modern" swords, yes? Just like certain cars have incorporated "nostalgic" features, like say the new Volkswagen Beetle, or the PT Cruiser. These are "modern" cars yes? I think this has already been covered, but there aren't more "modern" swords because there isn't much "modern" use for swords. Once they were fashionable for the general populace, they had specific meaning. We don't, as a rule, carry them around as part of our daily ensemble. They are no longer connotative of "nobility" or "honor", or perhaps such connotations themselves aren't so important to society any more. We don't generally use them to defend ourselves, there are other, more "modern" options, so where, exactly is the market to make them on a large scale? If there were a larger market, if there were a modern need, there would be more modern swords. i think, the last swords that were issued to the troops before discontinuation of swords, point the direction, development would have undergone. also the british 1885, 1899 and 1908 patterns. one earlier example, that in my opinion looks quite modern (functional, slim lines..??) 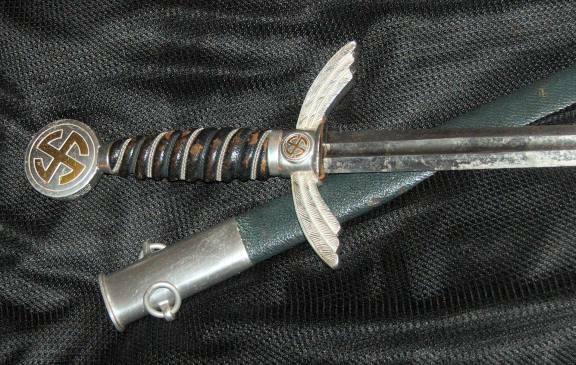 is the bavarian m1826 saber, i could not find a picture. if it comes for decoration, and ceremony, many countries went with time. I think Rob Criswell's swords are a good example of modern aesthetics in a fully functional sword. I remembered this from a long long time ago and I figured it might be worth a look - I believe it is just photo shopped together but its a good example of a 'hip' design. I believe there was a thread here wondering if people could walk around with swords freely and it was seen as fashionable , what kind of things they would come up with? =) Mostly horrible I'm sure but then there would be the gems too. 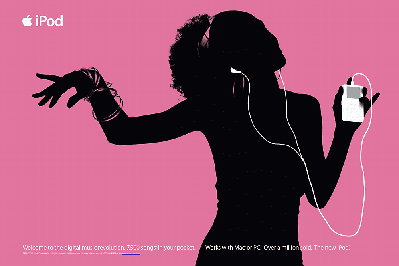 I believe it is just photo shopped together but its a good example of a 'hip' design. with a certain 700-year old female figure, with sword and buckler, for the Apple i.33. Correct me if I'm wrong, but didn't Western sword aesthetics undergo change over the years? weren't swords sometimes rehilted to conform to whatever the current trend or aesthetic ideal was? A Fiore or Talhoffer would presumably have owned a sword that not only was functional, but was the "hippest" design of the era. Transplant that same sword master to the present and wouldn't they still want a sword that, although just as functional, conformed to what is considered coolest in our time? If that's true, then what the heck would count as coolest in the present? "The Monks of Cool, whose tiny and exclusive monastery is hidden in a really cool and laid-back valley in the lower Ramtops, have a passing-out test for a novice. He is taken into a room full of all types of clothing and asked: Yo, my son, which of these is the most stylish thing to wear? And the correct answer is: Hey, whatever I select." As a maker you decide in what way or if at all you relate to the traditions of the craft. There is a great diversity in what is recognized as quality among both makers and customers. There is no real common ground in what is appreciated as key features of the sword. This makes the idea(s) of "modern" very open for interpretation. Where do you draw the line between concepts like historical, traditional, contemporary or timeless? How will the definition of these concepts impact the final shape, quality and aesthetic expression of the sword? Each maker will work from ideas about what is essential in a sword: in what ways it relates to tradition, function, materials and methods of manufacture. To search for a contemporary form of the sword is an interesting design problem, I think. For me that would mean a timeless expression that builds on and relates to tradition but is not constrained by it. I cannot imagine a sword that does not fulfill a role that has already been been defined by historical sword types. I cannot hope to improve on concepts that were perfected by generations of craftsmen. Even with strictly defined dynamic properties and dimensions for each sword type (if it is to fulfill its functional role), there is unlimited space for artistic expression. The trick is to know when artistic license intrudes on functional aspects. Below is an example of a sword that was made with the intention to be a timeless expression of a traditional sword type. A commission from a practitioner of Chinese martial arts, where the dynamic properties and function of the sword should be faithful to historical swords, but the form and material were chosen to be a contemporary expression of the craft. I thought I'd hate this thread but THAT is beautiful! A sword is simple in concept and function, therefore more likely to be reliable, it will never jam, misfire, or run out of ammo. A sword is more silent than any gun can hope to be. I present that a sword might possibly have special applications in which it could be used effectively where a firearm would fall short. Swords have had many shapes, some useful as weapons in their time, some not. The Bladesmith who taught me told me something he often reiterates: "A knife is a cutting tool, if it cannot do that, you can call it a work of art, or whatever else you want, but you can't call it a knife." If we are indeed discussing a "modern sword" to be used in it's capacity as a weapon, then it must fit the definition of a sword, and also meet the use standards of the evolving battlefield. Please forgive my ignorance, I look forward to any criticism or instruction from my fellow users who are obviously my superior in this study. -I actually found this site (and topic) as a result of my rEsearch on sword design, I am forging a (short-being less than 30 inches overall, single edged, selectively hardened, hand-and-a-half) sword of 1084 for myself. "Remember; it takes 43 muscles to frown, 17 muscles to smile, but only 3 for proper trigger squeeze." I believe that in order for the sword to hold a place in modern combat it would have to have a utilitarian function as well. The tomahawk has seen a huge surge in military usage because of its dual usage as a forcible entry tool and a weapon. A sword would potentially be able to be reworked in such a way that it was able to be used much like a machete for general hacking/chopping while still retaining usefulness as a weapon. A good example of a tool that fits a similar role might be the Condor Combat Machete, which much resembles a modernized gladius. It's suitably small such as not to be an encumbrance to a soldier carrying it with all of their other (very heavy) gear. Here in Norway, you are allowed to use machetes (so called "samekniv") if you are a border-guard in the north. Also, as the old cutlery forum joke goes..."SMATCHET!" I wondered how long it would be before someone mentioned the Smatchet or the Fairsword - discussed in detail elswhere on this forum. The Fairsword is a true example of a modern sword, designed for the OSS, along with a fighting style, for close combat. Not, I believe, widely used, but clearly designed for the true purpose of a sword (killing or maiming). Some of the exmples that still exist use modern materials (plastic etc. ), and whilst perhaps not aesthetically pleasing, has its own charm, as a weapon that may meet the OP's criteria. Welcome to one of the best forums on the planet, Jeni. My 2 cents (US). 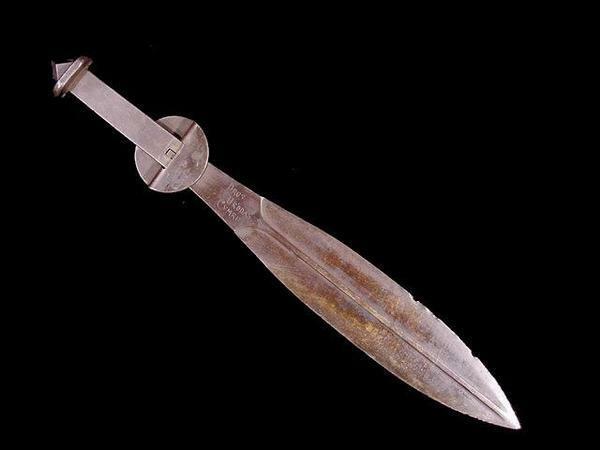 The roughly 3000 years of edged metal weapons pretty much allowed for the evolution of almost every conceivable type and then some, so one is hard pressed to improve significantly on what has been done and proven to work in the past. That being said I am very much in favor of seeing edged weapon progress more in the materials and processes areas given the massive improvement in metallurgy and fabrication techniques driven by the aerospace industry over the last half century or so. Even the most mundane 1050 or 1060 mild steel blade made today is of a more homogeneous and higher quality steel than that used say 500 years ago, and when a maker branches out into 5160 and other NiCrMo type steels, we are already pushing way beyond what was possible just prior to the mass use of firearms in war. I am in awe of the smiths who produce hand forged blades these days, but I think that the advent of CNC milling machines to produce high quality precision blades is a major step forward in that most working stiffs can actually afford to own one or more high quality blades now, so that is also a modern step forward for the good of us all. If you can afford a decent hunting rifle, you can afford an Albion or ATrim blade for about the same money. There is something special though for us history buffs about holding and using an artifact that is very similar to that which could have been wielded by Henry V or Charles Martel. It gives you that "aha" moment and you see back in time just that little bit more clearly. Also, few things let you see life through the eye of another person than trying to figure out how they made something. If you are looking for something modern and unique you might give Zombie Tools of Missoula, Montana a look. Chris and his staff have really come far in the last couple of years and make some very interesting blades. I'm hoping to give one of their pieces a good wringing out sometime this year and will forward the results, just for a walk on the wild side. It's a big smatchet. Note the difference in both blade shape and guard. 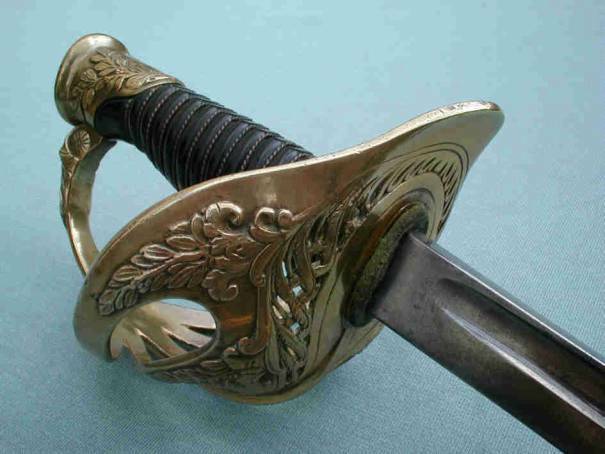 There are some modern sword designs: the Patton sabre for example. It came with a whole concept of using sabres in trench warfare. However, you have a general tendency to shorten fighting blades in the modern age, so no more zweihänders. The bat'leth is perhaps the most modern sword design, some stuntmen claimed it was quite good in defence. It even appears as a real weapon in several police reports. Well, it is at least a really new brainchild. I doubt that anyone in the position to logically use a sword designed for modern combat would be willing to carry anything with a blade over 30" and would prefer something in the 18"-24" range. The piece would also have to be able to lie relatively close to the body and not have too many projections that could snag on equipment and objects in the environment. Posted: Sun 10 Apr, 2011 3:48 pm Post subject: Re: The sword in our time. I think the French Order of Merit still presents each new member with a sword designed to highlight there area of specialty. Just to intervene on that specific pint : it's the Académie Française, whose members are allowed to wear a sword of office (and French law ha sit that they're the only ones in France legally allowed to carry a sword at any time....) - most of the time they have swords made that echo the reason why they've been called among the Immortals (as they are nicknamed). And msot of the time, the calling arrives when you're at a very old age. I hope my sword skills won't have gone too far down the hill by then. Apologies for derailing this thread - I'd happily have contributed, but I opted for silence, instead of the logorrhea this topic could inspire me when I'm in the mood. The link lists just one example of bayonets being used in recent wars. I also heard this of the French in Afghanistan. Well, it's a rare event and so it's news, especially in Germany, where we don't have bayonets since several decades ago. 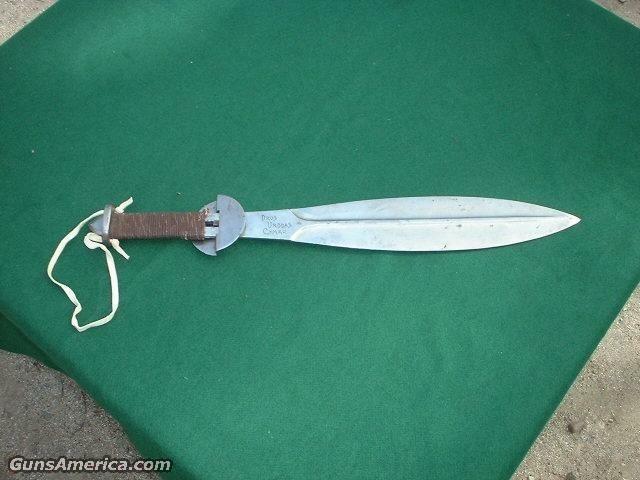 So, if there's a use for bayonets there will also be a market for swords (=long bayonets). Were I to design a "modern sword", it'd probably be a "short longsword" (something like 110cm), with spiked guard (à la Gaddhjalt but longer on one side than on the other), plus siderings and a knuckleguard (on the "longer" side of the guard), a pommel that could be used to slash or stab (perhaps something like a short, round spear point), and small Parierhaken on the blade. And a rather stiff, acute blade, something like a XVIIIb. The resulting sword would probably be rather ugly (especially with Parierhaken, I tend to dislike them and on a longsword... ). But it would possibly be quite good for "close combat" with halfswording techniques or bayonet techniques (which are partly similar). And still it could be used as a sword. Regarding aesthetics, I don't see much possibilities for a "modern-looking" sword, other than the very simple "tactical" look (i.e. completely blackened).